As I shared before on here, a couple of months ago, I received a review copy of a new release from IVP. 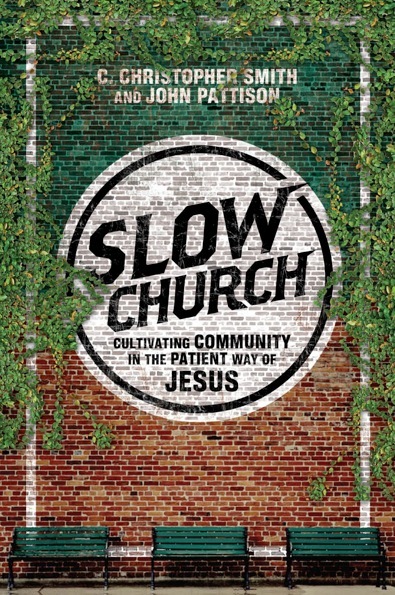 The book is Slow Church: Cultivating Community in the Patient Way of Jesus, co-authored by Christopher Smith and John Pattison. I can truly say that this is one of the better books I’ve read in my 17+ years as a Christian, for it captures a lot of what I see the church called to in the present-day. What is that call? Let’s explore through the lens of Slow Church. And, so, the authors of this book are calling us to “slow church,” that is, away from the McDonaldization and industrialization of the church that swept in like a tidal wave over the last half of the 20th century. The subtitle – Cultivating Community in the Patient Way of Jesus – lays out the thrust of their thesis. Community cannot ultimately be established in a few, short, microwavable steps. It takes time – time to put our roots down, time to know each other authentically and well, time to impact a neighborhood, time to do just about everything. As the authors report, sociologist, George Ritzer, identified four dimensions of McDonaldization: “efficiency, predictability, calculability (quantifiable results) and control – or at least the illusion of control” (p14-15). While these characteristics might be considered proper within a free-market business model (though I might personally challenge some of these if and as they become destructive to human beings and all of creation), they will accomplish little in the long-term of God’s plan amongst God’s people in God’s earth. You cannot franchise the kingdom of God, nor the expression of his kingdom within the local church. In contrast, Smith and Pattison reimagine the principles of the slow food movement through three categories: ethics, ecology and economy. A final chapter in the book shares how we, the church, the local church, can have dinner table conversations as a way of being church. Have we ever noticed how important food is in Scripture? And that’s been my own premise as of late: families don’t usually stare at the back of each other’s heads for an hour and a half. Of course, there is a time for gathered instruction, which we might accomplish in our Sunday gatherings. But even that whole time should be spent in better ways of engaging with God together and with one another together. As Larry Crabb notes in his book, Becoming a True Spiritual Community, we need to turn our chairs towards one another in conversation to build actual community, actual togetherness. I love the book’s proposal of slow church. I think God is in to slow, patient building – think of the long-haul perspective for revealing his Son and Messiah, Jesus; think of the patient unfolding of Scripture over centuries and centuries; think of the longest wait we’ve encountered as God’s people, that being the final summing up of all things at the coming of Jesus. God loves to take his good time. Perhaps we should take up the ways of our Father as well. Would I recommend this book? Well, noting I’ve said it’s one of the top books I’ve read in my Christian life, then, yes, of course, I would recommend it. To all – pastors, theologians and lay-folk. To all – Evangelicals, Protestant mainlines, Eastern Orthodox and Roman Catholics. Matter of fact, I think it will now be a main text of the Missiology class I teach in the spring. It’s well worth your time and investment. This entry was tagged book reviews, books, church. Bookmark the permalink. Scott. I am a huge fan of slow cooking and in many ways am involved in “Slow Church” ministry. I call what we are doing “Backwards Church” because we have built up relationships in our community where we have a weekly community bbq, mens group, monthly community gathering, which involves food, fellowship and sitting around a fire. We have youth group, school Scripture etc and are now, engaging with the community about holding a fellowship meeting and what that will look like. This book sounds like a must read and I will keep my eye out for it.